This review first ran in the March 29 edition of The Hamilton Spectator. So who wants to be a billionaire? You just need to build the Netflix-Amazon-Facebook of higher ed, with thousands of courses available online free of charge for everyone from Albania to Zimbabwe. Udacity and Coursera are two companies looking to do exactly that. 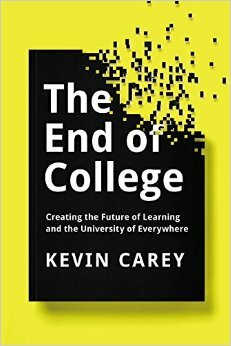 “From the moment Coursera and Udacity were created, people began asking how they would make money,” says Kevin Carey, author of The End of College. There’s huge and growing demand for higher education around the world as the ranks of the middle class swell. The global market for education is pegged at $4.6 trillion. Venture capital investment in education technology companies grew from less than $200 million in 2008 to more than $1.2 billion in 2013. It’s not just Silicon Valley start-ups that are aiming to reinvent colleges and universities. MIT and Harvard joined forces to launch edX in 2012. It’s a nonprofit that offers hundreds of free online courses custom-built by experts in technology, learning design, education services and videography. And that’s good news for people like Battushig Myanganbayar. Battushig was a 15-year-old high school student in Mongolia who took an edX course on circuits and electronics, earned a perfect score and got an offer to attend MIT as a 16-year-old freshman. “It may be hard for Ivy-obsessed parents and students to believe, but there are actually a large number of very bright students in America and around the world who don’t realize they might successfully apply to an elite college or university,” says Carey. Tech companies are also reinventing the college credential so employers can start making similar searches and judgments. Instead of paper transcripts and a diploma or degree that’s framed or filed away, our kids could graduate with badges for their online profiles. Employers could click on the badges to learn where they earned their credential, their marks on tests plus a portfolio of their projects and assignments. The badges could also be searchable online for employers who are looking for specific skill sets. “Rather than guessing what a vague credential like bachelor’s of computer science from Big State University at Anytown means, employers can use digital badge metadata to find exactly the person they need,” says Carey. These are still early days but Carey and the people he interviews see major changes on the near horizon. Some institutions will thrive, others won’t survive and new ones both real and virtual will be created. We could soon find ourselves being “educated in digital learning environments of unprecedented sophistication” as artificial intelligence make online courses adaptive to our individual learning styles with “personalized, individual education to large numbers of people at a reasonable price” delivered by colleges and universities. And that will have profound implications for anyone who works in postsecondary education, lives in a community where colleges and universities are anchor institutions or has young kids who are may bound for postsecondary education in the next decade. This review first ran in the March 16 edition of The Hamilton Spectator. Put a restaurant like Founding Farmers in the Lister Block and we’ll be lining up down James Street North. Founding Farmers in Washington, DC tops my list of favourite restaurants. The farm-to-table meals are outstanding, the service is always friendly and the bill won’t bust your credit card. But don’t take my word for it. Check out the 14,000 reviews on OpenTable, the 5,200 Yelp reviews and the 2,380 reviews on TripAdvisor. I never travel without first doing my homework on OpenTable and TripAdvisor. I rely on review and reservation websites to steer clear of tourist traps and discover great restaurants like Founding Farmers. And I’m not alone. By one count, 80 per cent of us now check online reviews before we buy. That’s good news if you’re a small business owner with a small advertising and marketing budget but a big value proposition for customers. It’s bad news if you’re selling a lousy product and service and coasting on brand recognition to bring customers through your doors. “Online reviews represent the first acquisition channel that is merit-based versus cash-based,” says Bill Tancer, author of Everyone’s a Critic and the general manager of global research at a marketing services firm. Online review sites deliver more than customers. All that feedback offers a blueprint for success. What are you doing that wins over and turns off your customers? What’s the competition doing to earn five star reviews? And what business gets lousy reviews but has customers lined up out the door? Deliver a better product or service and you’ll win dissatisfied customers who are waiting and hoping for something better to come along. Not every business owner is a fan of online reviews. Yes, there are fake reviewers, extortionists and one-star assassins. Reading a bad review can ruin your day. But dismissing online reviews could put you out of business, warns Tancer. Tancer offers five rules for earning five star reviews. Make reviews central to your online and face-to-face conversations with customers. Savvy businesses are posting and tweeting excerpts to expand the reach of online reviews. Some businesses are even winning customers by putting one-star reviews front and centre. Every business is in a war for customers. Tancer makes a compelling case for why you need a strategy for online reviews. Everyone’s a Critic should be required reading for every small business owner in Hamilton. This review first ran in the March 2 edition of The Hamilton Spectator. Every night I dump my spare change into a copper tobacco tin. The tin used to sit on a shelf above the wood stove in grandparents’ family room. Every dime my grandfather put into that tin was hard-earned. After serving in the Second World War, my grandfather spent more than 30 years installing and fixing gas stations. It was backbreaking blue collar work that left him frostbitten in winter and sunburnt in summer. A heart attack forced my grandfather into early retirement and we spent a lot of time together during my awkward and impressionable teenage years. We’d go to the Legion for lunch and spend afternoons driving up and down country back roads. We didn’t do a lot of talking. My grandfather wasn’t one for sermons and lectures. But he taught me some invaluable life lessons and did an expert job of disabusing me of any sense of entitlement or self-importance. The world owes us nothing, my grandfather would remind me. Everything must be earned. Always put in an honest day’s work. If you believe you deserve more or better, the onus is on you to go and get it. 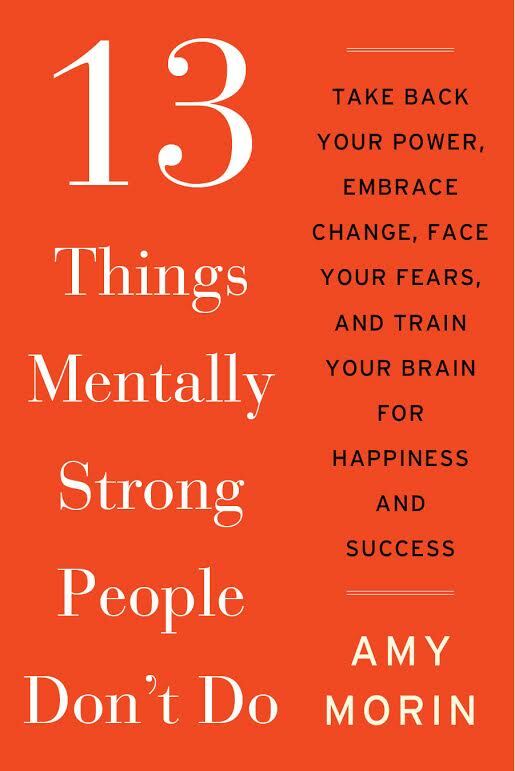 My grandfather would’ve scored high marks for mental strength from author, college prof and clinical social worker Amy Morin. That’s a winning combination that will make you indispensable at work. Morin’s identified 13 things that mentally strong people don’t do. Like my grandfather, they don’t feel the world owes them anything. Here are the 12 other things you don’t do when you’re mentally strong, according to Morin. You don’t waste time feeling sorry for yourself and indulging in self-pity. You don’t focus on things and people you can’t control. You don’t dwell on the past and let it distract you from the present. You don’t make the same mistakes over and over again. You don’t resent other people’s success. “I want what you have and I don’t want you to have it is” quickly wears thin and diminishes your shot at success. You don’t give up after the first failure. And you don’t expect immediate results. Patience really is a virtue. My grandfather would’ve approved and called Morin’s strategies common sense.